The recent National Research Council’s report on forensic science calls for more fundamental education and training in the science behind the discipline. Nowhere is this need greater than in crime scene investigations. Long seen as merely “bagging and tagging,” crime scene investigation and processing is now a complex process, involving numerous sciences and methods. The Science of Crime Scenes addresses the science behind the scenes and demonstrates the latest methods and technologies in depth.The Science of Crime Scenes covers the philosophy of crime scenes as historical events, the personnel involved at a scene (including the media), the detection of criminal traces and their reconstruction, and special crime scenes, such as mass disasters and terroristic events. 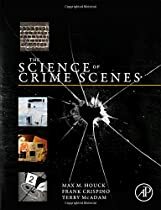 Written by an international trio of authors with decades of crime scene experience, The Science of Crime Scenes is the next generation of crime scene textbooks.